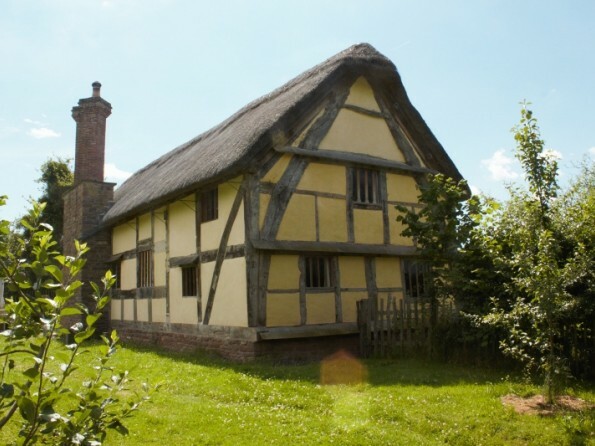 Located privately on the edge of a West Herefordshire village, Hacton Cruck is an award-winning restoration of a cruck framed hall dating from the late 14th/early 15th Century. 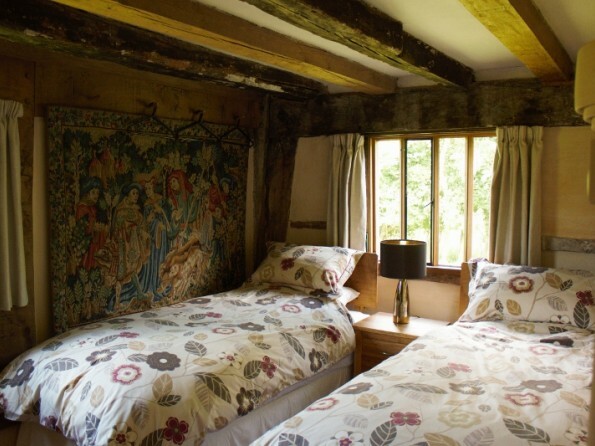 It now offers the rare opportunity to experience the atmosphere and romance of a medieval building in contemporary comfort. Slowly and lovingly worked on over a number of years, this open hall with its screens passage and gallery has been brought back to life. Particular attention has been paid to detail and all work has been done to a high standard using traditional methods and materials. If you are looking for character, this has it in abundance. 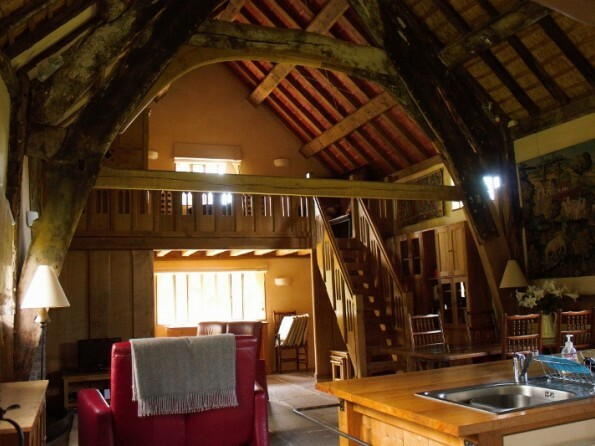 And if you’re interested in architecture, history, exploring the countryside, real darkness, peace and quiet, muddy walks and evenings spent playing games around the fireside then this will be the ideal hideaway for you. Located down a dead-end lane on the edge of a small village midway between Hereford and Hay-on-Wye, Hacton is a destination in its own right, though there is plenty of interest in the surrounding area. There are country houses, gardens and castles to explore, not to mention the Wye and Golden Valleys. There are picturesque black and white villages in abundance, and the beautiful walking country of the Black mountains and The Forest of Dean is on your doorstep. 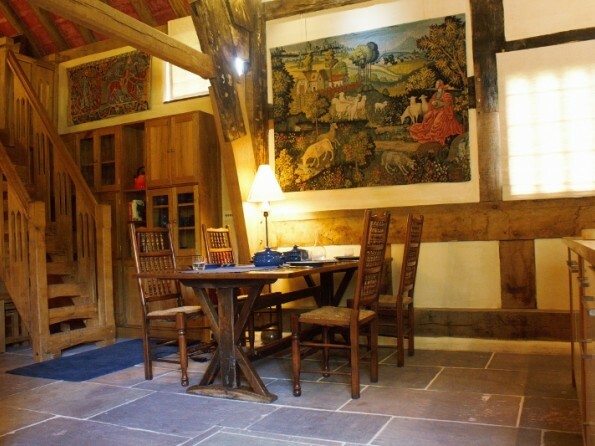 You will also find historic country towns like the book town of Hay-on-Wye and of course the county town of Hereford. Apart from the small pub and church the village is un-serviced - basic groceries and post office facilities are 4 miles away. A 10-15 minute drive brings you to Oakchurch, a very good farm shop which will keep you well provided for. A footpath runs past the property and a 20 minute walk through farmland takes you to the banks of the River Wye. 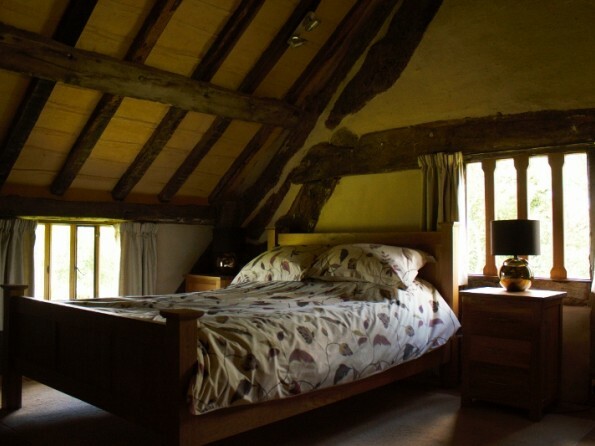 Hacton Cruck has two bedrooms - the downstairs bedroom has two single beds and the upstairs bedroom a king size double. 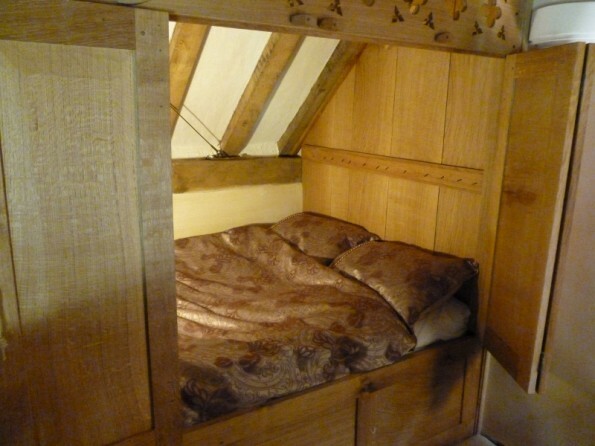 There will also soon be a bed-cupboard in the gallery. 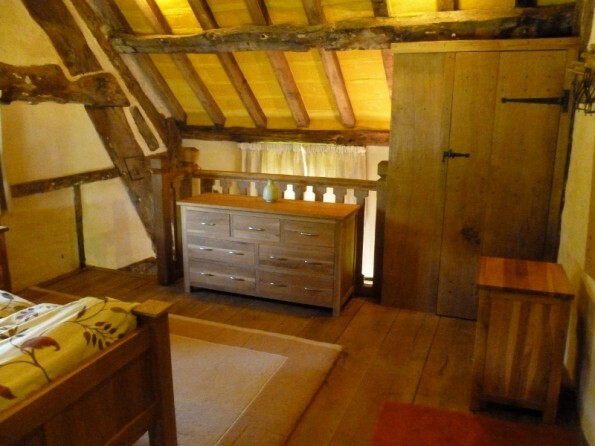 Bedroom furniture is contemporary solid oak. 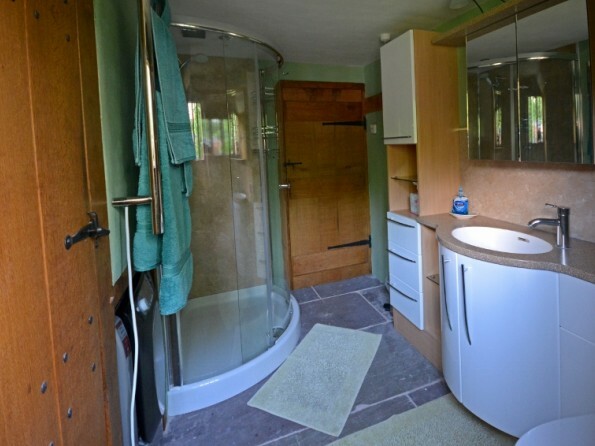 The kitchen has an induction hob, an electric oven, a fridge and dishwasher, a separate freezer and additional storage in the wall unit, and the bathroom has a good sized shower, a WC and a basin built into a unit with plenty of storage. The washing machine is under the stairs. 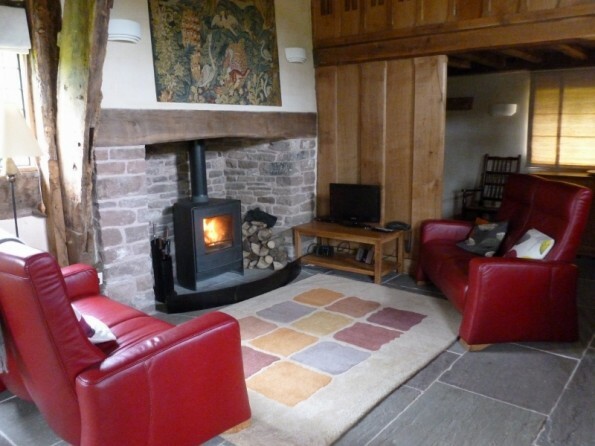 A ground source heat pump gently warms the floor slabs between mid-September and the end of April, while the wood burner in the living area is available all year round. A selection of books of local interest are provided, as are puzzles and board games, and the television comes with built in DVD player and a collection of films. Broadband and telephone are connected. The house sits on 3 acres of pastureland and old orchard, and birds and wildlife are abundant. Sheep graze right up to the front of the house while the back is private and fenced off, with a pleasant outdoor seating and barbecue area. A path leads to a shed with a good supply of dry firewood. The driveway leads to the back of the house where there is parking space for two cars. 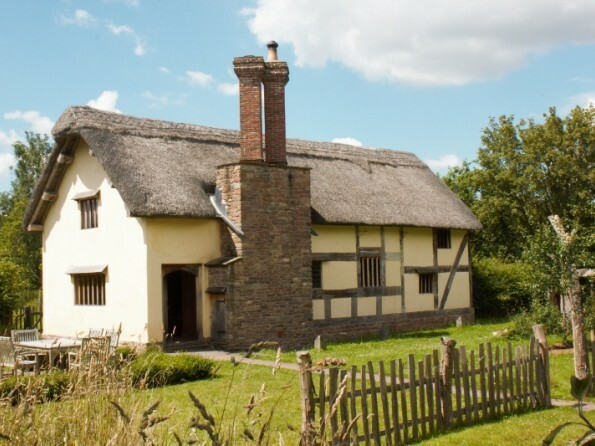 Although it has modern facilities, furnishings and technology, please take into account that in essence Hacton Cruck is a 600 old medieval hall! Owing to limited access to the bathroom, and a step down into the bedroom end, the house is not suitable for wheelchair access. While a steep solid tread stair goes to the gallery and could prove difficult for less able-bodied persons, the stairs to the main bedroom are wide and an easy pitch. There is no door at either the top or bottom of the stairs leading to the main bedroom though a turn in the stairs gives visual privacy. Whether it is suitable for children is up to parents. If you would like to know more about the history of the house and the area, or about the restoration itself, please see the website. Please arrive after 3pm on first day of booking and depart before 10am on last day. For bookings made within 3 months of the start of holiday, payment is required in full. For bookings made more than 3 months from start date, a 30% deposit is payable at time of booking and the balance must be paid in full 3 months from the start of stay. All bedding, towels and tea towels are provided, as is washing machine and dishwasher powder/liquid, cleaning materials etc. You will find milk in the fridge and tea and coffee in the cupboard. We do not have pets in the building, and it is most definitely a no smoking venue.